In this, Fly-Carpin's first ever guest post, we are going to hear from Dan Frasier on his favorite dry fly for carp. Dan, the fly fishing editor at CarpPro.net, is a heck of a writer, better fly-carper and even better friend. 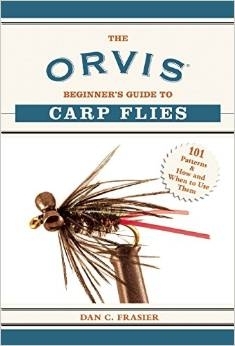 His first book "The Orvis Beginner's Guide to Carp Flies" is currently available for pre-order at amazon.com and will start shipping late January. You may also recognize one of the fly photographers. Some dude named McTage. You came to the stream expecting to dredge a couple of nymphs in the deepest holes and pound up a few trout. That's what works most of the time: getting deep and feeding the fish what they are eating. But as you pushed your way through the brush downstream of the slow moving pool you see that today is different. Today the fish are up and eating. Gently picking tiny sailboats off of the surface. Great pods of torpedoes are casually assaulting the armada of mayflies as they make a break for the tail-out of the pool and safety. This isn't what you expected. You thought you'd be blind-casting to deep water. So you get out of the stream and head upstream, looking for trout that are holding deep like you thought they would. Right? That's how you would approach this situation? Of course you wouldn't. Finding trout, carp, or any fish for that matter, actively feeding on the surface is something to be cherished. You'd snap into fly fisherman detective mode, the one we're all constantly trying improve, and look for what bugs were on the surface. You'd tie on the nearest imitation you have and get stealthy. You'd have to contain your excitement at the prospect of catching fish on floating flies for the rest of the evening. Why is it, then, that we react so totally differently when we encounter surface feeding carp? Anglers walk away, looking for tailers. Or they tie on a crayfish and cast it at the pod of rising carp. At best they stumble over themselves looking for a big hopper pattern without knowing if hoppers are even on the menu. In a sense I’m lucky that I didn't know anything when I first attempted to catch carp on the fly. I carried no preconceived notions, and was immune to the idea that there was a right way to do this and everyone else knew it. Instead I had to figure it out on my own. Don’t get me wrong, I went to the resources available and read and studied them, but they were all trout focused. So there was very little specific information available about carp, but there was a lot written about how to approach and evaluate a fishing situation. That’s the information that proved invaluable. In my book, The Orvis Beginners Guide to Carp Flies; 101 Patterns & How and When to Use Them, it took thirteen patterns to scratch the surface (pun absolutely intended) of the dry flies a carp fly fishermen should be carrying. Carp rise to a variety of different floating food organisms, and like any fly fishing, a good angler will spend a little time looking and listening and figuring out what the carp are eating. After they have an idea of the forage, they will try to imitate it, and only then will they feel confident in their fly. Ok, got it. Match the hatch. But what happens when you can’t tell what the fish are eating? Simple, do what you would for trout. Tie on a generic confidence pattern and start there. Get smaller if it’s getting refused and worry most about your presentation. For me, that confidence fly for carp is a size 14 Parachute Adams. The low profile allows the fly to float low in the film, making it easier for the carp to eat with their oddly shaped mouths. Additionally, the Adams is a good generalist pattern, imitating many possible bugs that the carp might be picking off of the surface. Using an Adams allowed me to catch nearly a third of all my carp last year on dryflies. If you’re keeping track at home, that means a third of my carp were on dries, a third on nymphs and a third tailing to crayfish or other larger organisms. Not a bad split and a good way to keep things interesting when you approach your carp water. Merry Christmas! 1/3 on dry flies huh, man you are a lucky guy. I am lucky for a once a year chance. Still, total agreement about the adams, what a fly. Gregg... Yeah they are on top here a lot! They Adam's is an amazing fly. Breaks so many of the traditional thinking about the need to perfectly match the hatch. Good article. it has started me to think about the dry flies I currently fish. I have used tarantulas, madam X,deer hair "bread flies", in sizes 14 - 8. Bill...Tarantulas and Madam X are both flies I've fished myself. Good stuff, Dan. The Parachute Adams was always my money dry fly with trout and it's leaning that direction with carp as well. I don't see nearly as many carp up on top as you do. Probably for the best. If I could catch a third of my carp on dry flies I would probably be living out of my boat. Or in a van down by the river.